Apium graveolens var. rapaceum also known as Celeriac, Celery Root, Knob Celery, Turnip-Root Celery, Turnip-Rooted Celery is a member of celery family and is native to Italy. It is a kind of celery, grown as a root vegetable for its large and bulbous hypocotyl rather than for its stem and leaves. Celeriac may be used raw or fresh. It is also known as Gen Qin Cai in China, Ache-Douce in France, Eppich in German, Sedano Rapa in Italy and Kornevoi Sel’derei in Russia. It is best to peel celeriac just before use, since the outer skin is tough and stringy. It is a popular winter-season root vegetable used as mashed in dishes, in soups, and stews, especially in the country-side of Eastern and North European regions. Celeriac is a deciduous, herbaceous biennial, erect vegetable sized 1 m high and 0.5 m wide grown for its delicious, knotted underground root. It is normally found growing in temperate climatic regime, cool and moist places and prefers rich, moist and friable soil. Roots are usually large round brown 7–12 cm across. Celeriac has pinnate leaves with rhombic leaflets and hollow stalks. Flowers are creamy white, 2-3 mm in diameter and are produced in dense compound umbels. Seeds are broad ovoid to globose, 1.5–2 mm long and wide. 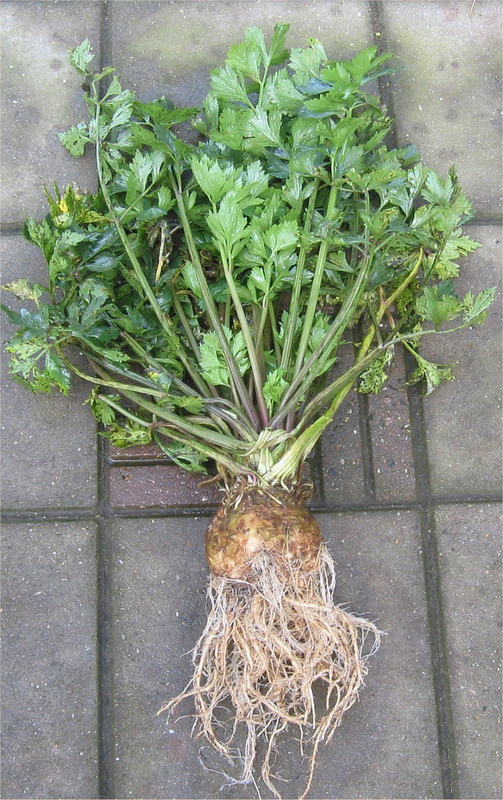 As mentioned earlier celeriac are normally grown for its delightful, knotted underground root. It is a well-known winter season root vegetable mainly used in soups, stews or even consumed raw. Roots are big, swollen, knotted, and rounded to odd shape, nearly 7–12 cm across. It has brown, rough skin that is thick and spotted and covers creamy white flesh which is extremely delicious, crispy and firm. It features nutty, earthy, sweet, subtle celery flavor while taste is bit like celery and parsley. Apart from its delightful taste it is full of essential minerals, vitamins and nutrients which are essential to live healthy and happy life. 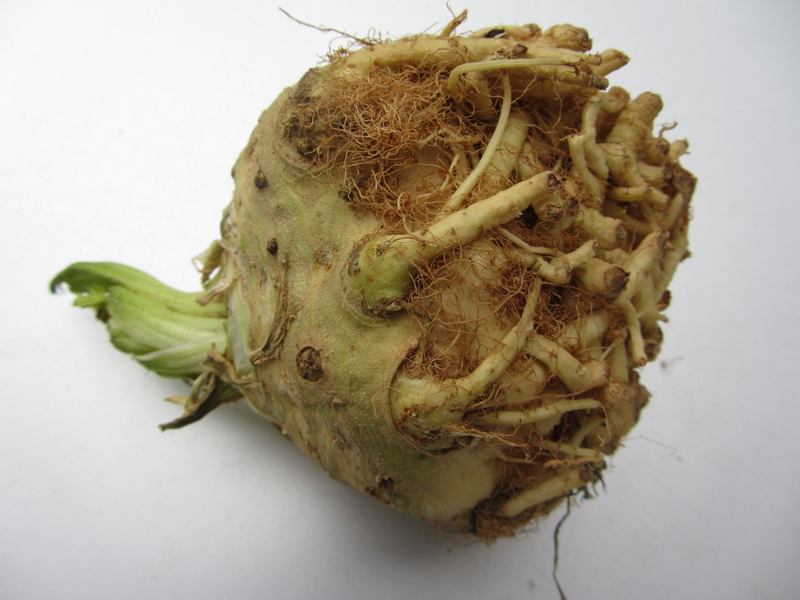 Swiss and Italian botanists first termed celeriac root during 1600s. 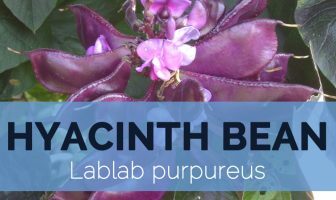 It was found growing wild in the Mediterranean and in northern Europe and was used as a medicine for numerous health problems. In the 19th century it was introduced in the United States and it is now cultivated around the world including in North Africa, South-West Asia and Siberia. It is mostly cultivated in Central and Eastern Europe and the Netherlands. Apart from their distinctive taste similar to celery and parsley celeriac is a wonderful source of nutrients, vitamins and minerals. Consuming 156g of celeriac offers 64 µg of Vitamin K (phylloquinone), 179 mg of Phosphorus, 0.257 mg of Vitamin B6 (Pyridoxine), 12.5 mg of Vitamin C (Ascorbic acid), 1.09 mg of Iron, 0.109 mg of Copper, 14.35 g of Carbohydrate, 0.549 mg of Vitamin B5, 0.246 mg of Manganese and 156 mg of Sodium. Calories 66 Kcal. Calories from Fat 4.23 Kcal. 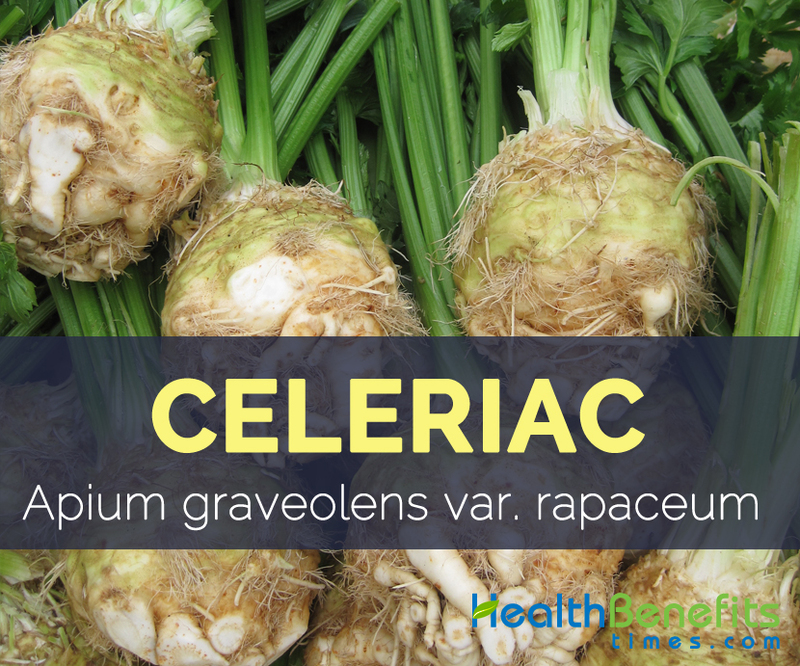 Celeriac is an herbaceous biennial vegetable which can be found growing in cool and moist place. It is a popular root vegetable for its big and bulbous hypocotyl which has taste similar to celery and parsley, normally one single hypocotyl weights 1-2 pound. Due to its distinctive taste it is found used in several dishes, soups, and stews as well as consumed raw. Vitamin B6 also known as Pyridoxine is a powerful vitamin, and there is a lot of it available in Celeriac. One serving offers 20% of your daily supply of Vitamin B6, which helps in the manufacture of neurotransmitters, the chemicals that allow brain and nerve cells to communicate with one another, confirming that metabolic processes such as fat and protein metabolism run effortlessly, and is significant for immune system function in older persons. It can also help deal with conditions, like nerve compression injuries (like carpal tunnel syndrome), some cases of depression and arthritis and premenstrual syndrome (PMS). Increased homocysteine levels might accelerate dopaminergic cell death in Parkinson’s disease through neurotoxic effects; therefore, increasing intake of B vitamins involved within the managements of homocysteine metabolism may decrease the risk of PD through declining plasma homocysteine. Research concluded that sufficient intake of vitamin B6 was related with reduced chance of Parkinson’s disease. (4) Celeriac contain 14% of daily require value of Vitamin B6. Celeriac consists of vitamin K, numerous antioxidants like vitamin C, vitamin E, Selenium Lutein and Zeaxanthin, and small quantities of omega-3 fatty acids. All these vitamins, antioxidants and omega-3s work together to keep arteries clear of hazardous plague buildup, to lower cholesterol levels, to combat high blood pressure, to increase blood flow and to sustain healthy, strong blood vessels. Such important benefits decrease the chance of heart attack as well as other cardiovascular problems that affect millions of people every year. Arthritis sufferers even choose to wear copper bracelets or bands because it is supposed that copper is absorbed by skin and can help minimize painful symptoms. (10) Apart from that certain topical applications made up of potassium have shown some promise as anti-inflammatory agents. One current research mixed potassium with a topical rub and is applied to the joint, with the patient reporting reduced pain. Celeriac is a multipurpose vegetable and are used both cooked and raw in salads. It is also used as a flavoring in casseroles, stews and soups, but can also be mashed or baked. Mashed celeriac is best when mixed with other root vegetable like potatoes to create a smoother purée consistency. Classic dish celeriac remoulade, where the vegetable is grated or cut into small pieces and served with a mustard mayonnaise. It is used raw in salads, grated and frequently tossed with creamy salad dressings. Celeriac combines well with meats such as pork, lamb and duck and herbs like bay leaves and thyme. The leaves can also be used as flavoring in soups or eaten raw but have a very powerful flavor. The leaves can be dried for flavoring salt. Seed or its essential oil is also used as flavoring agents. It has been stated to have insect repellent property; it repels the cabbage white butterfly thus it is a good companion for tomatoes, Allium and Brassica vegetables. Celeriac contains several furano-coumarin compounds like bergapten, psoralen, xanthotoxin and isopimpinellin which may cause skin to burn (photo-toxicity) in some sensitive individuals. Moreover, like celery, it must be avoided in large quantities in pregnant women. People on diuretic medications and anti-coagulant medications should use this root cautiously. 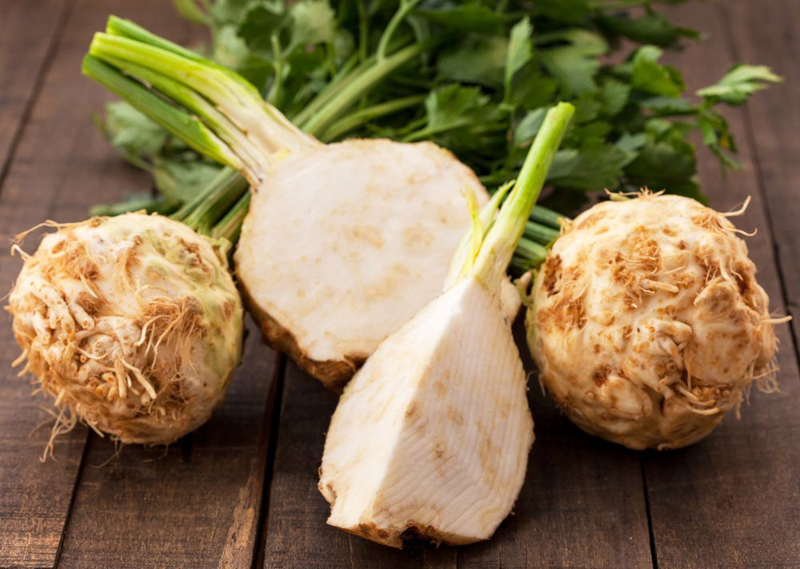 Celeriac is a well-known root vegetable which is native to Italy and is extremely popular nowadays due to its important vitamins, minerals and essential nutrients. It is cultivated worldwide due to its benefits. Growing Climate Temperate climatic regime, cool and moist. Root Color Brown, rough skin, thick and mottled. Root Flavor Sweet, earthy, nutty, delicate celery flavor. Flower Flowers are creamy white, 2–3 mm diameter, produced in dense compound umbels. Seed Broad ovoid to globose, 1.5–2 mm long and wide. Apium graveolens var. Gr. rapaceum Alef.